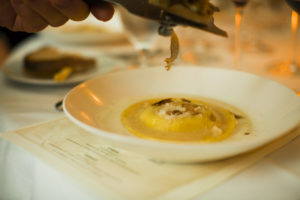 The annual celebration of white truffle season, Festa dei Tartufi Bianchi, begins Wednesday, November 1 at Perbacco! Chef Staffan is offering a variety of dishes, simply prepared and served with three grams of white truffles shaved tableside. Chef also selected a few black autumn truffles that will be featured in two of the below dishes. These aromatic and memorable dishes will be available until November 18 exclusively during dinner service. We hope you will join us to savor this precious delicacy. Sample dishes can be found below and reservation can be made by calling: (415) 955-0663.